The thrift shop I was in had a bunch of these 600w grow lights, mostly HPS and a couple of MH. One was an EYE 600w HPS made in the USA! Didn't buy any, $25 ea. Don't think it is a Sunmaster, it's some other make and it's Chinese. However there's an Ushio in the box, made in Germany. I would've grabbed the U.S. made eye lamp and try to haggle the price down. 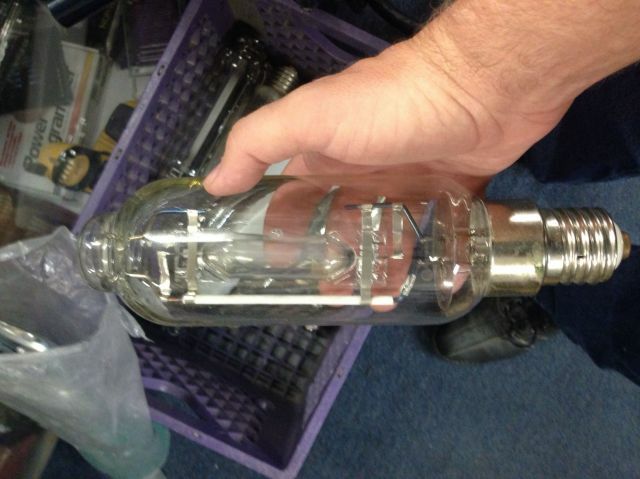 It's actually an ET18 like 250w and 400w lamps, but with a longer neck. What thrift store did you find those lamps? It's a regular thrift store in San Bernardino, CA. Gina's if I recall correctly. What would happen if you ran this on a 700w ballast? Would it start and run well? 700w ballasts are hard enough to find anyway, so the chances of this happening is still very small.